National Day Of Action to end State violence against Black girls and women. The Black Lives Matter movement has been critical in making police brutality against African-Americans a national issue. There are concerns, however, that stories of female victims are left out. 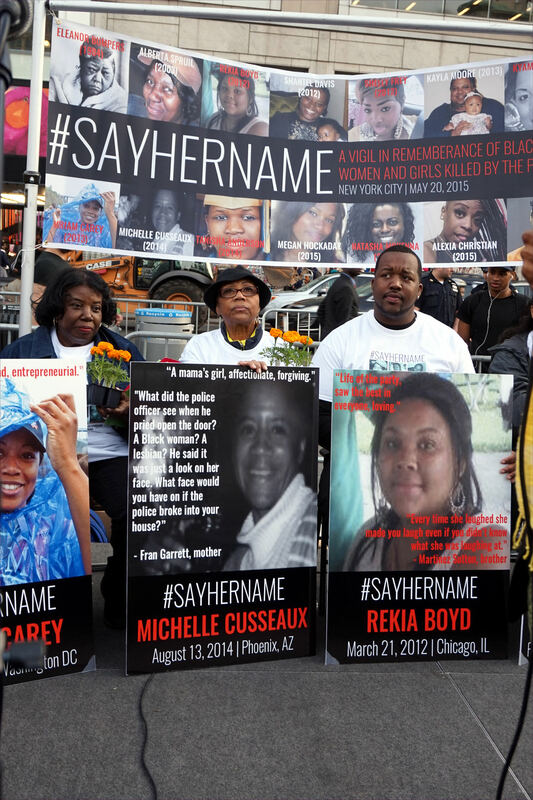 Let&apos;s learn more about a new hashtag campaign, #SayHerName. It refers to black women who have been part of police-involved shootings. Some say they have been neglected in the Black Lives Matter movement, that their names and voices have been left out. From member station WBEZ in Chicago, Natalie Moore has the story. NATALIE MOORE, BYLINE: Page May is a black woman, teacher and community activist. She&apos;s been part of Chicago campaigns taking on police brutality. After an officer was acquitted this spring in the shooting death of 22-year-old Rekia Boyd, May helped plan a rally to get him fired. She successfully planned similar actions in response to the death of black men. PAGE MAY: We did this big epic march around Baltimore and Freddie Gray. And I was expecting a similar level of hype. I was pumped. I was ready to go. And I get there, and there&apos;s less than 200 people. And most of them are black women, which is beautiful. But that hurt. 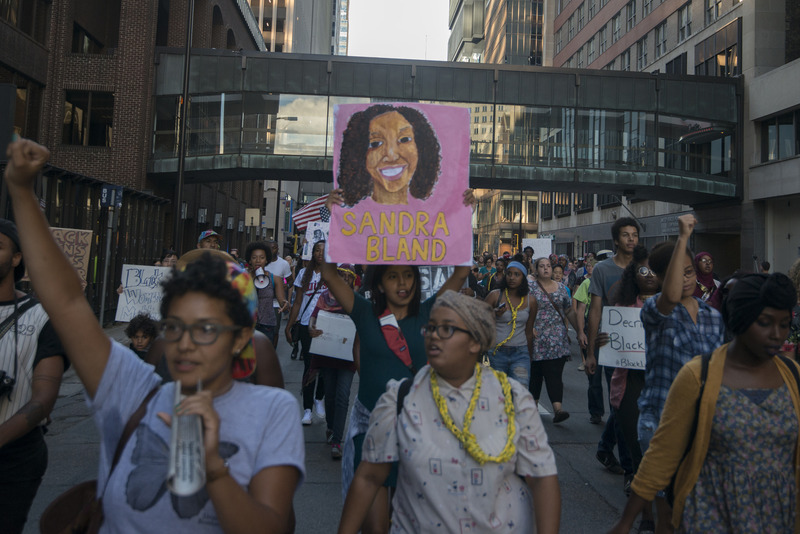 MOORE: But at a September protest, hundreds of people did show up for Rekia Boyd. MAY: Are you all pumped up? MAY: That ain&apos;t good enough. Are you all pumped up? MAY: OK, all right, we got this. MOORE: May attributes the large turnout to the Say Her Name campaign, an effort to make sure black women&apos;s stories aren&apos;t lost in the national dialogue about police brutality. Kimberle Crenshaw is a professor at Columbia University Law School and co-authored a report called "Say Her Name" this summer. KIMBERLE CRENSHAW: What happens to women isn&apos;t often seen as indicative of the entire community&apos;s vulnerability but as an unfortunate circumstance that happened to a particular individual. CRENSHAW: We&apos;re not used to demanding justice for black women&apos;s families. This is just a habit of marginalizing what happens to the women in our community. MOORE: Shaun King is a writer and activist engaged in Black Lives Matter. He admits stories of black men dominate his discussions about police violence too. SHAUN KING: I never had the intention of just sharing the stories of men. But I found myself doing that even before Trayvon, before Mike Brown, before Eric Garner. Almost all the stories I told were always of men. And a lot of women, including women in my family and in my circle and my friends, were doing the same thing. MOORE: King says his turning point was the death of Sandra Bland, the Illinois woman who died in a Texas jail days after a traffic stop this past July. There&apos;s no reliable data on how many black women have lost their lives during and after encounters with police. Crenshaw&apos;s report counted fatalities since 2014, including Natasha McKenna of Virginia, who died after being Tasered in police custody, and Yvette Smith of Texas, who police shot after a domestic dispute in her home. Crenshaw says the challenge for those in Black Lives Matter is that they must consistently create a broader umbrella. CRENSHAW: It really is about moving consistently, coherently and productively against racial injustice. And for that to happen, they have to be broadly responsive to all the ways that people of color are being made vulnerable to both state violence and other forms of violence. UNIDENTIFIED PROTESTER: (Chanting) Rekia Boyd was a freedom fighter, and she taught us how to fight. UNIDENTIFIED PROTESTERS: (Chanting) Say what? MOORE: And back in Chicago, Page May is keeping up the fight for Rekia Boyd. In October, she and organizers convened again, using song and performance art. MAY: We have to say her name until we get to a point where black women are being shown the respect that they deserve and that black people are showing up to defend black women at the same level that they are defending black men. MOORE: For NPR News, I&apos;m Natalie Moore in Chicago.